UPDATED: The House has passed Rep. McKinley’s bill by a vote of 267-144. As I write this, I’m watching the debate in the U.S. House of Representatives of Rep. David McKinley’s legislation to strip the federal Environmental Protection Agency of its authority to create tough nationwide regulations for the handling and disposal of toxic coal ash from power plants. A vote is expected later today, and given the GOP control of the House, it appears likely to legislation will pass (keep in mind, of course that quite a few Democrats — such as West Virginia’s Rep. Nick J. Rahall — are backing the bill). H.R. 2273 not only prevents the EPA from regulating it as a hazardous material, but establishes a new regulatory framework, similar but more stringent to that of municipal solid waste landfills, and will safeguard both jobs and public health. The states will have primacy over the regulation of coal ash, but EPA retains its ability to step in when necessary. Now remember that state regulatory systems for coal ash are considered wildly inadequate, and here in West Virginia, the state Department of Environmental Protection couldn’t even keep track of how many coal-ash impoundments the state had. He has racked up more than $187,000 in mining related donations, including coal, more than any other federal candidate this election cycle, according to the Center for Responsive Politics. McKinley has also done well with utilities, having received roughly $46,000 in related donations, among the top getters. 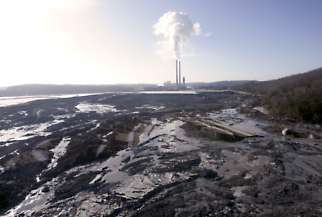 Watching today’s debate, it’s worth remembering what drove toxic coal-ash disposal — a long simmering issue ignored by many policymakers and the media — to the top of the EPA’s agenda: The massive failure of a huge coal-ash impoundment in Tennessee in 2008 (subscription required). My friend Jim Bruggers at the Louisville Courier-Journal did a major series on the subject more than a decade ago, and some other great reporting on the issue has been produced by Sue Sturgis at Facing South and by Kristen Lombardi at the Center for Public Integrity. This is ridiculous. The house will vote in any bill that’s pushed through, as long as it’s from one of their own. Fly ash has been found by scientists to contain as much radiation (or more) than spent nuclear waste. If this goes through as a full bill, it will write a blank check to the state to crap all over the land more than it already has, in the name of “jobs”. I could burn down a town or dump a boatload of garbage in the street and it could create more jobs… but I’m not donating hundreds of thousands of dollars to politicians to do so. This guy needs to go.